The Coverage Report enables you to check the coverage rate of each function, you can also easily find the not-yet-passed Test Points. It is expected to improve the coverage rate by checking the Not-Executed Test Point and configuring the Test property of DT10. First of all, you find the Not-Executed Test Point. You open the Coverage Report and double click the Function which contains the Not-Executed Test Point (= Function with coverage rate less than 100%). When you double click the Function, you jump to the fist Test Point corresponding Function in source code window. ※In the following figure, we focus on the PwmMain function with 87.5% Statement coverage rate. It has passed 6 Test Points out of 7 valid Test Points; so we will find the rest of one Not-Executed Test Point. we will find the Not-Executed Test Point in the source code window. Please find a Not-Executed Test Point (Green color) within the jumped Function. 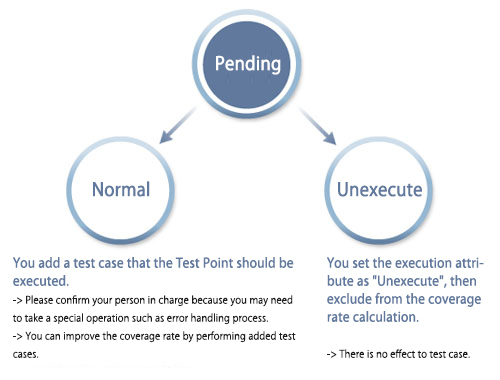 After you finished the overall test, you can find test case leaks by checking the Not-Executed Test Point. You also need to determine whether a Not-Executed Test Point should be really passed or not. In case that the Test Point should not be passed even though written in the source code, such as fail safe process, you should eliminate this from the calculation of the Coverage Rate, otherwise, the Coverage Rate would not reach to 100%. 1. You configure the execution attribute of the Not-Executed Test Point as “Pending”. Pending… Indicates that this Test Point is not yet determined to be executed or not. ②2. You assign “Pending” Test Point either “Unexecute” or “Normal”. You change the execution attribute by selecting combo box of test property editor. The test property editor will be opened by [Test Plan] -> [Property editor] in menu. We expect the following effect by verifying the Not-Executed Test Point. You confirmed the executed at all branch in real operation. You make it clear that each branch should be “To be Executed Point” or “To be Not Executed Point”. 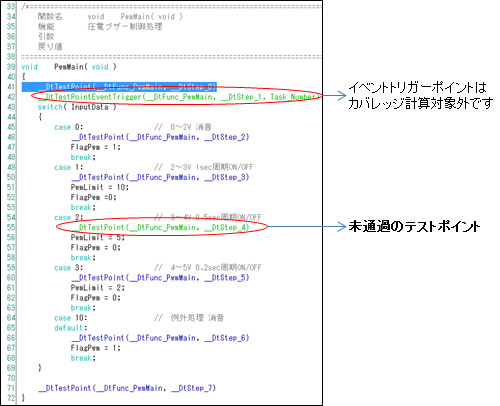 -> Even if a program pass the “Unexecute” point, it will be warned in the Test Report. You can verify the leakage of test case and recover it. -> The fact that there was a Not-Executed Test Point means that you did not consider the test case to be executed the Test Point. The leak of check list will be minimized by recovering it. You can prepare the test case with 100% coverage rate by repeating this recovery of test case. You can perform the step-over execution by using the short cut key prepared in Function Trace. It is useful in case that you do not like to type in function. 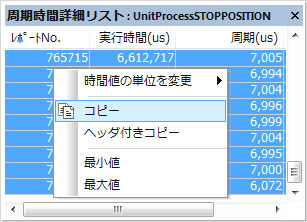 When you are operating in Function Trace Report, you can go forward / backward with F8 /F7 keys. By adding shift key, F8+Shift / F7+Shift are allows you to go forward / backward within the same task and same nest. 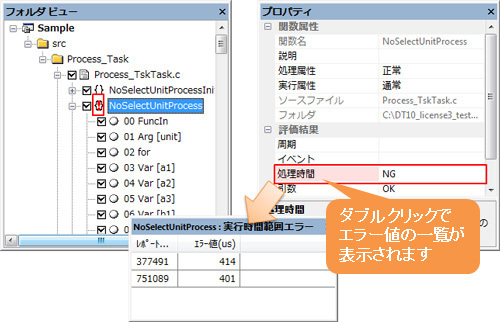 By using this function, you can follow the flow of process by performing Step Over within the same task. 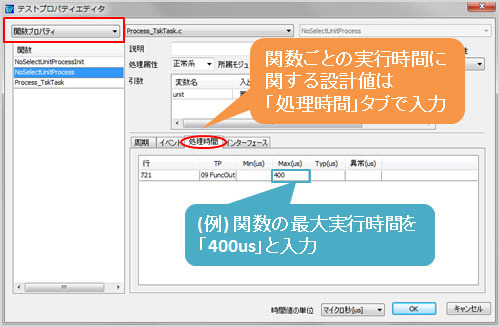 By using the short cut keys prepared in Function Trace, you can synchronize the movement of Function Trace with Test Report. 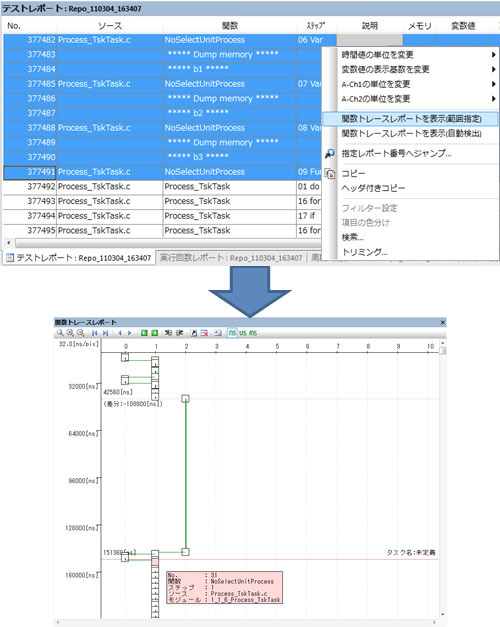 It is useful for you to check the movement of process in Function Trace, Source code window and Test Report simultaneously. By adding Ctrl key, F8+Ctrl / F7+Ctrl are allows you to go forward / backward with synchronizing the step position of Test Report. Moreover, by adding Shift key to F8+Ctrl / F7+Ctrl ; F8+Ctrl+Shift / F7+Ctrl+Shift are allows you to step over forward / backward with synchronization. In Execution Time Detail List and Period Time Detail List, you can sort the items in ascending / descending order by clicking item name of “Report No.”, “Process Time”, “Period”. The sorting function of DT10 may take long time depending on the volume of data. It depends on the specification of your PC. In such a case, we recommend to use sorting function of spread sheet, for example, Microsoft Excel. You choose all lines in detail list and right click it; select “Copy” in the menu. You can selective lines in detail list by clicking the starting point and then clicking the ending point with “Shift” key. You paste the copied data onto the spread sheet and sort the column with sort function of the software. In Execution Time Report and Period Time Report, you can check the information of Execution Time and Period Time for each function. However, it is difficult to determine the value in Test Report satisfy the design value in default status. So you enter the design value in advance in order to find the value outside the range of design values by using the property editor. DT10′s “Report Analysis” feature will show you the value outside the range of design values by comparing the measured value in obtained Test Report and the design value. You enter the design value in using property editor. You enter the design value of Execution Time and Period Time for each function in using Function property. Period Time can be entered in “Period” tab and Execution Time can be entered in “Process Time” tab. The “Report Analysis” compares the input design value with the measured value in Test Report and determined OK/NG. The following table indicates the NG condition for each item. When NG condition occurred, the “!! mark indicates in folder module view. When you noticed “!” mark, you should select the item to check in what item the NG has occurred with property view. By entering the design value of Execution Time or Period Time in advance, you can easily find the value outside the range of design values among large amount of Report Data. This is especially effective tool for Period Time of periodic function which may affect to whole system performance. When you check Execution Time Report or Period Time Report, you may find an abnormal process in which the Max time was too large in compared with the average time or the design value. In such case, you need to investigate which process causes this issue. You can follow the flow of process by using Execution Time Detail List or Period Time Detail List. In Execution Time Report or Period Time Report, when you double click the line of function which you need to check the process of maximum time, the detail list of that function appears. You right click in the detail list, select “Max value” in the menu. So you will jump to the line of maximum time in the detail list. If the maximum time is out of range of design value, the designated line shows in red color as shown in the above figure. In detail list, when you double click any line, the designated line of Report Data is shown. At this point, the “No.” fields of designated range of Test Report are in green color, it allows you to check the range clearly. Additionally, you can display only this green colored range on Function Trace Report. You choose the green colored range of Test Report and right click to pop up the menu; then select “Display of Function Trace Report(Range specification)”. So you will find the Function Trace Report displaying only specified range. You notice the range to be investigated in graphically displayed Function Trace Report. In this way, you may find the process which took too much time by using Test Report and Function Trace Report. It is possible to aggregate the multiple Test Report in the same profile. The Report Data obtained by DT10 output only log data which the target generate in the operation. So it is rare to get the satisfied coverage rate in one Test Report generation. You can get the objective coverage rate by aggregating the multiple Test Report. The report you can use for aggregation is limited within the Report Data of the same profile. Please noted that if you change the source code (including the operation of Test Point), you can not use the previous Report Data for aggregation. In order to perform the aggregation of multiple report, you select [Report Analysis] -> [Multiple Analysis of Test Reports] in menu. You choose the report to be aggregated in the dialog. You turn ON the report to be aggregated, and click “OK”. You will find an aggregate report with designated report data (aggregate coverage report, aggregate Execution Time Report, aggregate Period Time Report, aggregate Execution Count Report). 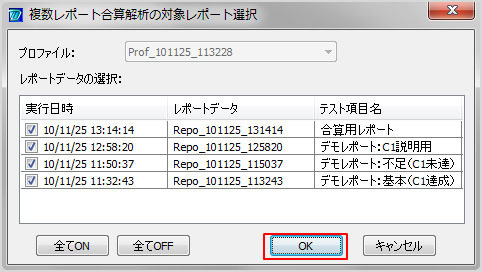 While the aggregate report is displaying, the background of folder view, module view become gray and modification is prohibited such as insertion, deletion of Test Point, property settings. The aggregate report can be exported as CSV file. If you open other report or you select “Close Report Data” in file menu, the aggregate report will be closed.